Conservation is the act of preservation, protection, or restoration of the natural environment. We hams are conservationists as we tend to be a thrifty lot and regularly re-purpose and reuse materials for our hobby. Why throw something into a landfill when it can be made into something useful? Through creativity and technical know how we conserve materials (and funds). The smell of solder and a few minutes in the workshop is great fun too! Minimal contact resistance at high current, wiping action cleans contact surface during connection/disconnection. Provides visual identification of proper mating connector. Secures individual connectors into "keyed" assemblies which prevents mis-connection with similar configurations. Anderson Powerpoles have emerged as the defacto power connector standard in the amateur radio community. 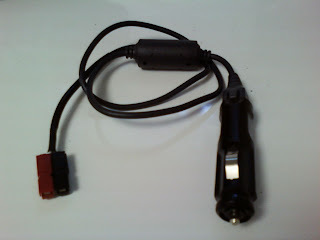 Unfortunately, vehicles provide power for passe "cigarette lighters" and not Anderson PowerPole connectors. Come on Detroit, time to get with it and provide Anderson Powerpole outlets in your vehicles. A boring solution would have been to buy a couple of vehicle power to Anderson PowerPole adapters which typically sell for about $15.00 at ham fests. However, a quick survey of our junk box revealed several unused vehicle power cables which could be readily adapted to Anderson Powerpole connectors for very little cost. Step 1: Prepare the cable by snipping off the unneeded end. Step 2: Strip both wires about 5/16 inches (7.9 mm). Step 3: Brush on rosin flux and tin the wires. Be careful not to apply too much heat and melt the insulation. If you do melt the insulation a little, just trim up the exposed wires to maintain the 5/16 inch length. Step 4: Slip the cable through the 2 inch length of heat shrink tubing. This provides a nice dressed looking cable. Additionally, the heat shrink tubing will provide strain relief. Step 5: Melt rosin flux into the Anderson Powerpole connectors. Solder the connectors onto the tinned wires. Step 6: Using the multimeter, determine the vehicle adapter's center contact. Install the red Anderson Powerpole's by inserting the contact and wire into the housing from the rear. Position contact and push forward so that contact slips under the barrier and snaps over the end of the retaining spring. Tug slightly to make sure contact is locked in place. Step 7: Install the black Anderson Powerpole's by inserting the contact and wire into the housing from the rear. Position contact and push forward so that contact slips under the barrier and snaps over the end of the retaining spring. Tug slightly to make sure contact is locked in place. Step 8: Using the multimeter, confirm continuity of red contact with the vehicle adapter center conductor. (and no continuity with the outer spring contacts). Confirm continuity of the black contact with the vehicle adapter out spring contacts (and no continuity with the vehicle adapter center conductor). Step 9: Dovetail the two connectors together and interlock the red and black Anderson Powerpole by slipping the keyed parts together as pictured above. Step 10: Slide the heat shrink tubing forward as close to the Anderson Powerpole connectors as possible. Use a blow dryer or other heat source to gently shrink the tubing until snug. Avoid burning or melting the heat shrink tubing. Voila! That is all it takes to make a vehicle power / Anderson PowerPole cable adapter. This is a fun and easy project that has the added advantage of saving money. Since it is possible that vehicle manufacturers may reverse polarity of the power output, be sure to use your multimeter or Anderson PowerPole Polarity Checker to confirm that red Anderson Powerpole connector is indeed positive on your vehicle prior to using the cable. We built our cable for use with low power devices. Be sure to use a cable suitable for the current your device will draw. An in line fuse or fuse integrated into the tip of the vehicle power adapter is a good idea. Adding a ferrite bead or two can do wonders with keeping RF off the power cable (our junk box cable came with a ferrite already installed). © Michael W. Maher and NJ2X.COM, 2011. Unauthorized use and/or duplication of this material without express and written permission from this blog’s author and/or owner is strictly prohibited. Excerpts and links may be used, provided that full and clear credit is given to Michael W. Maher and NJ2X.COM with appropriate and specific direction to the original content.